A new study by the University of Connecticut finds that practicing yoga may improve protein utilization among older women, and lead to the maintenance of muscle at a time in life when muscle loss is common. The study, forthcoming in the Journal of Aging and Physical Activity, is the first to look at the relationship between yoga and the body's protein use. Protein utilization is a key factor in maintaining muscle at any age, but particularly important when it comes to preventing debilitating age-related muscle loss, or sarcopenia, according to author Nancy Rodriguez, a nutritional physiologist. "Weight-bearing exercise is important as we age," says Rodriguez. "The purpose of this study was to look at yoga as an alternative form of exercise for maintaining muscle mass with aging." Aptly named NAMASTE (Novel Approaches to Maintaining Muscle and Strength), the study followed two groups of healthy women aged 50 to 65 for six months. One group had not done routine exercise for at least a year. The other group was made up of women who practiced Vinyasa yoga at least two times a week for a minimum of a year. Vinyasa yoga is considered a more vigorous practice and includes numerous sun salutations, a movement shown to increase heart rate and improve cardiovascular endurance. The current paper reports on the first phase of the study, when differences in protein utilization, strength, balance, and body composition between the yoga practitioners and their less active counterparts were determined. Researchers also looked at differences in calorie and protein intake between groups. Protein use by the body was assessed by following nitrogen from the amino acid glycine. Rodriguez and her team characterized strength by testing hand grip, and balance was evaluated by using timed one-legged standing tests, having participants stand three times for three seconds with their hands on their hips. For diet assessment, researchers monitored weekly diet records for calorie, carbohydrate, fat, and protein intake. Although body weight and body mass index were similar, body fat was lower and muscle mass higher for the yoga group. And those practicing yoga tended to have better balance. Yogis burned more fat at rest than their non-exercising counterparts and had lower rates of protein synthesis and breakdown. This reduced rate of protein turnover may be associated with maintenance of muscle mass resulting from routine yoga practice. Studies over the last decade show that eating more protein actually makes it easier to lose and maintain weight and can improve cardiovascular lipid profiles. A higher protein diet can also improve blood pressure and glucose control, particularly for individuals with Type II diabetes, Rodriguez says. Protein is composed of essential amino acids: an essential nutrient is one our bodies cannot make, that must be provided through diet. "The body turns over protein all the time," she says. "You're building protein and breaking it down. Studies show that exercise increases protein synthesis. Therefore, higher protein intake, combined with routine yoga practice, should contribute to maintenance of muscle by offsetting muscle losses and enhancing the body's ability to build muscle at the same time." 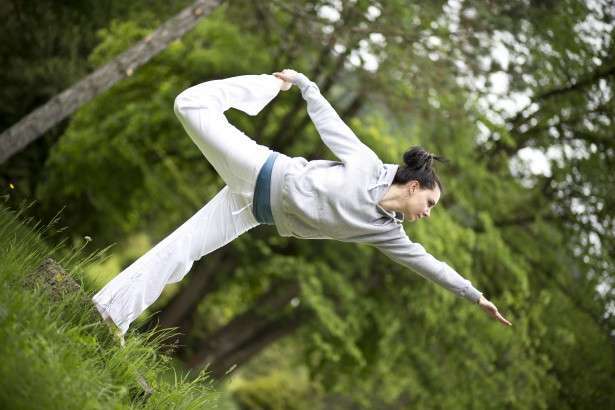 Funded by the Dairy Research Institute, the study lays the groundwork for further research into yoga and healthy aging. Rodriguez, who practices yoga herself, says the mind/body benefits of yoga are an area of particular interest to her. The effects of yoga on the use of protein by the body suggests that this form of exercise offers a multitude of benefits that support healthy, active aging, she says. The comparatively low stress of yoga on joints – compared to running, for example – makes it accessible and easier for older adults to sustain. And it's less dangerous than weight training, which can result in injury if done improperly. The study is part of a growing body of scientific research linking yoga to health benefits including reduced stress, lower blood pressure, and improved health in cancer patients. "More people are practicing yoga than ever before," says Rodriquez, noting the adoption of the practice in recent years by the military as well as college and professional athletes. "The physical benefits of yoga – strength, flexibility, and reduced body fat, as well as improved health outcomes – are like icing on the cake. The mind/body aspect of yoga contributes to the sustainability of the practice, and that will allow people to maintain it."